Abkhaz separatist leaders say they will not accept a peace plan proposed by Germany on behalf of the UN secretary-general’s Group of Friends of Georgia. “We can’t consider this plan in the condition it has been presented today,” de facto Abkhaz president Sergey Bagapsh said after meeting with Hans-Dieter Lucas, the German diplomat who presented the plan in Sukhumi on July 14. Georgian troops must be withdrawn from Kodori Gorge—a sliver of the breakaway region controlled by the central state government—as a precondition for talks to restart, he told the Messenger yesterday. Tbilisi maintains that only police are deployed there. Repeating earlier statements from Abkhaz officials, Shamba said another precondition for talks is for Tbilisi to sign a non-resumption of hostilities agreement. Details of the German-backed plan have not been officially released and remain hazy. German newspaper Der Spiegel recently reported what it says are the main points. The first stage would focus on building trust between the Georgian and Abkhaz sides which would include “declarations renouncing violence,” according to the newspaper. In the second stage foreign donors would help reconstruct the breakaway region before final political status issues are hammered out in the third stage, Der Spiegel reported. The plan was among the issues discussed when President Mikheil Saakashvili met German Chancellor Angela Merkel last month in Berlin. “This plan will be refined, together with the Georgian government, but the major articles are already formulated,” a statement on the Georgian president’s website reads. Russia, which is also part of the UN Group of Friends of Georgia, did not contribute to drawing up the plan. While Moscow’s official position on the plan is not known, last week it echoed the de facto Abkhaz authorities’ preconditions for resuming any form of talks. Bagapsh, the de facto Abkhaz president, has underlined that his administration will accept nothing short of independence as a result of talks. 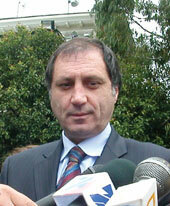 “The political status of Abkhazia is not going to be discussed with anybody. We are building an independent and democratic state,” Russian news agency ITAR-TASS quoted him as saying. The UN secretary-general’s Group of Friends of Georgia consists of Britain, France, Germany, Russia and the US.